At Mobile World Congress SanDisk announced a microSD card coming with a massive 200GBs of space. That's for consumers to buy. But there's something for manufacturers too. The company has also announced improved iNAND storage to pack inside mobile devices. 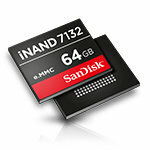 As always, the new iNAND 7132 storage solution is SanDisk's most advanced yet. The company's latest embedded flash drive offers faster transfer speeds, enabling improved performance for burst photography and 4k video capture.